Rivets, screws and welds are a thing of the past when you incorporate 3M™ science into everyday tasks. But how? 3M™ VHB™ Tape is a solution that uses adhesive and foam in an exciting new way, creating a permanent and strong bond when adhering two surfaces together. For over 30 years, this high quality industrial tape has been used in a range of industries, such as Building & Construction, General Manufacturing, Aerospace and Commercial Vehicles. The secret behind this tapes sticking power is the type of adhesive and foam that is used. 3M™ VHB™ Tape is an innovative acrylic foam tape that is created using closed cell foam and pressure sensitive adhesive. Compared to standard mechanical fasteners, such as screws or rivets, that join two surfaces at a single point, VHB™ Tape is able to spread the stress load along the entire length of the joint and hold surfaces securely together. How can I incorporate 3M™ VHB™ Tape in my business? Depending on the tasks you need to complete, there are a number of solutions to pick from. The RP Series is an ideal solution for general industrial tasks, interior fit outs or mounting signage around your business, whether inside or outdoors. It can be applied on a variety of surfaces, including glass, metal, sealed wood, plastics and painted surfaces. When you need a robust tape for those tougher tasks, the VHB™ 4000 Series is ideal. They perform well outdoors and in harsh environmental applications. They can also be applied to a range of surfaces, such as glass, rigid PVC, acrylic, polycarbonate, architectural facades and painted or sealed wood. 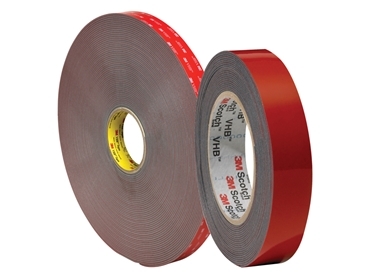 This series of tape is ideal for bonding, mounting and attaching tasks. In every business, time savings are just as important as (and directly related to) cost savings. VHB™ Tape could be the solution you need to create vital process efficiencies. When used for the right task, 3M™ VHB™ Tape can aid in removing the drilling, screwing, refinishing and clean-up etc. that using screws and bolts can create. Using VHB™ Tape is as simple as preparing the surface, cutting the required length of tape and joining the two surfaces together.